Here are the foundations of truth that we have shared worldwide. Here are the reasons for our faith, the secrets of our joy, the strength of our ministries, the keys to our long success, set in a framework of dynamic Bible basics that have brought God's miraculous power to millions for over half a century. Here is The Message That Works. What we've taught has created a better world. Millions have been lifted out of despair, disease, delusion, and defeat. These truths can be fundamental guidelines for Gospel ministers, beacons of inspiration for Bible students, and vital seeds of miracle blessings for YOU. 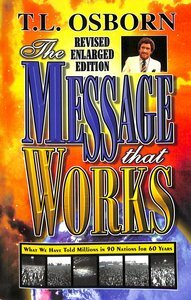 About "The Message That Works"